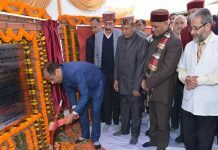 Shimla: Union Human Resource Minister Prakash Javadekar and Chief Minister Jai Ram Thakur laid foundation stone of Central University of Himachal Pradesh at Dehra in Kangra district today. Prakash Javadekar said that the forest clearance for construction of this University was also accorded when he was the Union Forest and Environment Minister. He said that this University would open new vistas of development in the area besides providing quality higher education to the youth of the area. He said that the Union Government would provide all possible help to ensure that the University Campus would completed soon. Union Human Resource Minister said that the Centre has sanctioned several nation institutions in the State. He said that IIIT has been sanctioned for Una and IIT for Mandi. He said that Cluster University has also been sanctioned for Mandi district. He said that in addition to this, several Central Schools have also been sanctioned for the State. He said that the Union Government was committed to provide digital boards in the schools in a phased manner in about nine lakh schools of the country. Speaking on the occasion Chief Minister said that the Central University will have two campuses at two different locations. He said that the first Campus would be at Jadrangal near Dharamshala, which would be spread in an area of 750 hectare. The second campus would be established at Dehra in an area of 287 hectare. Jai Ram Thakur said that the State Government soon after assuming office in the State deposited Rs 6 crore under CAMP Act for forest clearance, so that the construction of this campus could start at the earliest by diverting forest land for non forest purpose. Chief Minister said that about Rs.1300 crore would be spent on construction of both these campus and the same would be completed in next three years. He said that both these campus would be spread in an area of about 1000 hectare making it one of the biggest University of the region. 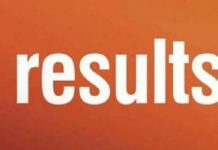 Jai Ram Thakur said that the State Government was committed to provide quality education to the Students of the State. He said that an amount of Rs.7044 crore were being spend on education sector during the current financial year and a provision of Rs.7600 crore had been made for the next financial year for this vital sector which shows the commitment of the State Government to make Himachal Pradesh an education hub of the Country. He said that the State was way ahead from other states in field of education. He said that the literacy rate of the State was second to Kerala in the country. The Chief Minister said that the previous State Government made tall claims about education but did nothing on ground. He said that twenty one colleges were announced by the previous State Government during the last one month of its tenure without any budget provisions and with an eye on elections. He said that the present Government was ensuring that all the education institutions in the State have appropriated infrastructure and staff. He said that even the Prime Minister Narendra Modi has appreciated the welfare and development oriented policies and programmes launched by the State Government. He said that the Centre Government also sanctioned Developmental Projects worth Rs.10,500 crore for the State. The Chief Minister announced upgradation of Government Middle School Khabli to High School and High School Bane di Hatti to Senior Secondary School. He also announced that this Senior Secondary School Bane di Hatti would be named after Shaheed Vijender Singh. He also announced PWD Sub Division at Haripur and upgradation of 100 bedded Civil Hospital Dehra to 150 bedded Hospital. He also announced Science classes in Haripur college and opening of PHC at Dhaliyara. He also announced upgradation of Sub Tehsil Haripur to Tehsil. He said that Rs. 52 crore BRICS projects would also be sanctioned for Dehra area. He said that a new Building of Nagar Parishad Dehra would be constructed. Education Minister Suresh Bhardwaj said that it was during the tenure of the previous BJP State Government that process of setting up of Central University was initiated in the State, but the previous Congress State Government did nothing in this direction. He said that Himachal Pradesh has been ranked as the top most State of the Country in Education Sector, which shows the concern of the State Government for providing quality education to the youth of the State. He said that over 3500 teachers have been recruited in the State and process was on to recruit 5000 more teachers in the State which was a record in itself. Member of Parliament Hamirpur Parliamentary area Anurag Thakur said that the Central University was gift from the Union Government to the State of Himachal Pradesh in general and for the people of Kangra in particular. He said that it was way back in 2015 that all clearances were accorded by the Centre, but the then State Government failed to provide appropriate land to this University. He also detailed various Central sponsored schemes being implemented in the State. MLA Hoshiyar Singh welcomed the Union Minister and Chief Minister to his home Constituency and detailed various developmental demands of the area. Former Minister Ravinder Singh Ravi said that the previous State Government created hurdles in setting of the University and it was due to the efforts of the present State Government that today the Campus was seeing the light of the day. Vice Chancellor Dr. Kuldeep Chand Agnihotri while welcoming the Union Minister, Chief Minister and other dignitaries said that the Central University would go a long way in providing quality education to the youth of the State. Former Chief Minister Prof. Prem Kumar Dhumal, Member of Parliament from Kangra Parliamentary area and former Chief Minister Shanta Kumar, Rural Development and Panchayati Raj Minister Virender Kanwar, Industries Minister Bikram Singh, State BJP President Satpal Singh Satti, Vice Chairman State Planning Board Ramesh Dhawala, Vice Chairman HRTC Vijay Agnihotri, Joint Secretary HRD Ministry G.C. Hosur, Principal Secretary Education K.K. Pant, Chancellor Central University of Himachal Pradesh Prof. Harminder Singh Bedi, Director Higher Education Dr. Amarjit Sharma, Deputy Commissioner Kangra Sandeep Kumar, SP Kangra Santosh Patiyal were present on the occasion among others.